« The Bulls are Suffering from a New Year’s Hangover! I am really delighted to see that some of you are refreshing your memory by referring back to previous blog notes such as “The $64 Question: How Big will the Correction Be?” and “Ian’s Musings – Some Principles of HGS Investing”. 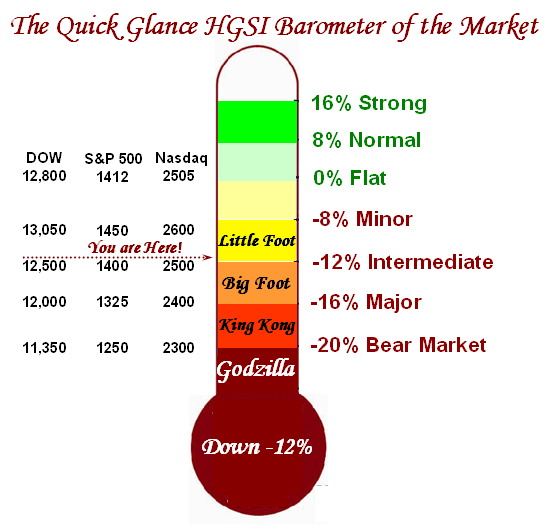 As such, I felt that a picture is worth a thousand words and I can kill several birds with one stone by using the “Quick Glance HGSI Barometer”. U.S. stocks on Friday sank for a third time this week, with the Nasdaq Composite Index hit with its steepest drop since Feb. 27, 2007, after a jump in unemployment spelled a likely recession for investors. Since 1949, the unemployment rate has never risen by this magnitude without the economy being in recession, according to John Ryding, a chief economist at Bear Stearns. The Dow Jones Industrial Average fell 256.5 points, or 2%, to 12,800.2, with 29 of the blue-chip index’s 30 components finishing in the red, giving the Dow a weekly fall of 4.3%. Broader equities indexes declined as well, with the S&P 500 Index dropping 35.53 points, or 2.5%, to 1,411.63, translating into a 4.5% decline from a week ago. Down for a sixth consecutive session, the Nasdaq Composite Index was hit the hardest, shedding 98.03 points, or 3.8%, to 2,504.65, with the tech-heavy index falling to lows not seen since the end of August. After rising to a record intraday high of $100.09 a barrel on Thursday, crude pulled lower as worries about the economy sparked thoughts of reduced demand. Oil futures ended $1.27 at $97.91 a barrel on the New York Mercantile Exchange. Ahead of Wall Street’s opening bell, the Labor Department reported U.S. seasonally adjusted non-farm payrolls climbed by 18,000 in December, the weakest growth since August 2003. Stocks retained their losses after the Institute for Supply Management reported its non-manufacturing index fell to 53.9 in December from 54.1 in November. Volume on the New York Stock Exchange topped 1.6 billion and nearly 2.5 billion on the Nasdaq, while declining stocks brushed aside those advancing by more than 3 to 1 on the NYSE and nearly 5 to 1 on the Nasdaq. Are the favorite Wolf Packs still the leaders? Is the herd buying the dips or waiting for the bounce plays to sell short these very stocks? What happens to the Gorilla stocks of the five horsemen…GOOG, AAPL, RIMM, GRMN and BIDU? Are they swooning for a deep correction or will they find a bottom and bounce with opportunities for climbing aboard for the next ride? As they go, so goes the Nasdaq and Market. Are we in the thick of a true rotation and if so which are the New Wolf Packs? Health Care? 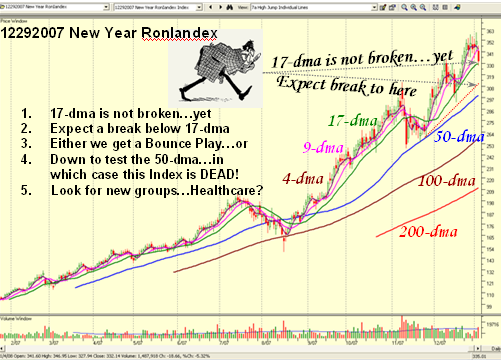 Can the RonIandex hold the 17-dma line or will it confirm that the Party is Over for this set of stocks and hence that we are in for a bleak period with more on the downside? 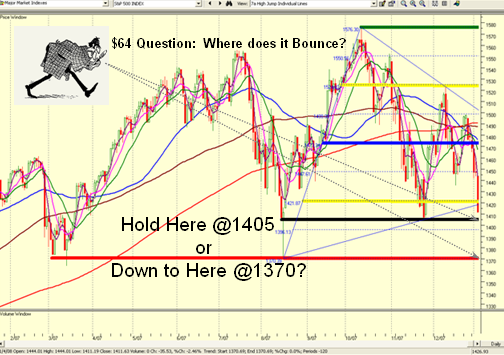 The $64 Question for Monday: Does the S&P 500 hold here and bounce from an oversold Market with five down days in a row or go down further to test the Base Low at 1370? What tricks will the FOMC and Administration have up their sleeves in advance of the next Fed meeting towards the end of this month? What bright ideas might unfold to prop up the economy and hence the Market in the State of the Union Address? What are the early Earnings Reports showing…good or disappointing news? How do the Global Markets react tonight and first thing tomorrow…more on the downside? Watch for the market behavior if a Bounce Play starts…don’t be too quick to buy but consider selling your losers and then possibly shorting the stocks you sell to make lemonade out of lemons. You all know what you are doing, but don’t try to ride it through with losers. They go down further. Best Regards, Ian. This entry was posted on Saturday, January 5th, 2008 at 5:25 pm	and is filed under Market Analysis. You can follow any responses to this entry through the RSS 2.0 feed. Both comments and pings are currently closed.